We live in ever-changing times: political instability, BREXIT, international unrest, threats from cyber-crime and terrorism, climate change and more. In some ways, you could say the world around us is a bit of a risky business - and that’s where Risk Management comes in. The importance of looking ahead and working out how to take all these issues into account is greater than ever before, particularly if our industry is to continue prospering. Examples of risks being managed include ensuring our businesses are resilient to a cyber attack and ensuring that contracts deliver their desired outcomes. We’re acutely aware of risk in the NDA and to get better at this, professionals and directors from across the ‘risk’ industry came together in Manchester to learn about international best practice and how to work together to improve in the future. The conference was the third organised by the Nuclear Industry Risk Management Association (NIRMA) and was better than ever before. Approximately 50 people attended the two-day conference which consisted of directors and risk professionals from across the industry. 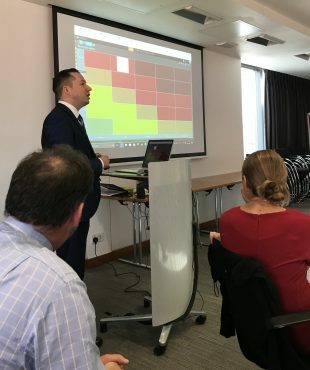 Presentations from lead risk management organisations Price Waterhouse Coopers, the Institute of Risk Management, Association for Project Management, Infrastructure Risk Group, Network Rail and Turner and Townsend all brought everyone up to speed with the latest thinking. This was followed by a series of workshops to identify how risk professionals can provide improved support to directors and executives in the future. At the NDA, our executives and risk professionals spend a lot of time and energy discussing risk management, and planning how to deal with it, but there is always room for improvement. Events like this make sure that the whole UK industry is aligned to good international practice and new thinking. They also provide the time and space to think what risk professionals need to do to truly add value to the decision-makers.